first oil change cx5 2.5NA. mazda oil w/ moly 0w20 from factory. 2724 miles on the car. Pretty typical for the break-in period. Thanks for sharing. Here's my 6th and final UOA. This winter was a brutally cold one for us. 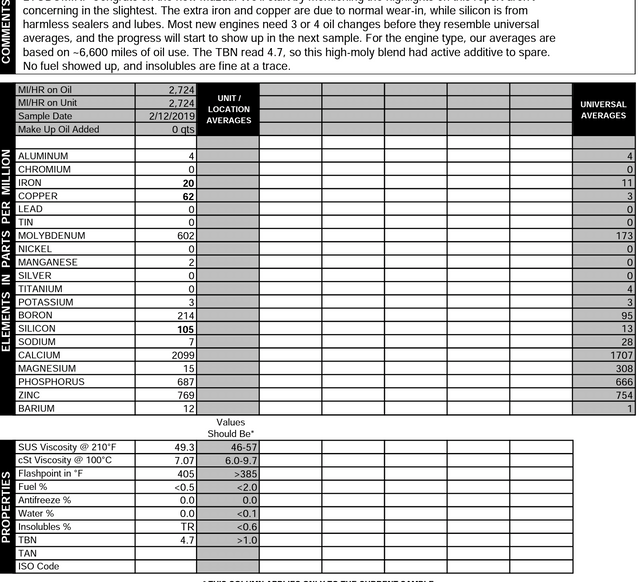 I think the colder temps, combined with higher idle times, more stop/go and short trips is what caused the increase in Iron. Typically we don't idle as much and we take longer weekend trips, we've cut down considerably on these trips which is what has kept the mileage down. Also, just before changing, the wife went on a 6 mile trip which I think contributed to the fuel dilution as well. Unlike the other OCIs, this one didn't require a top off of any kind. Technically the others didn't require one either as I was only down 1/2 quart or less, but with Maxlife in the sump, I didn't lose any noticeable amount from the dipstick. Last edited by RepeatMazda; 04-12-2019 at 10:36 AM. Looks like a little dilution issue at your 2/3/17 analysis (more so than your current one), with only Trace amounts in the analyses during the warmer months. I guess that makes sense, huh? Seems like evaluating oil performance needs to take seasonality into account, however one might adjust for that. Was the TBN your only option added to the Standard Test? Did you have an idea as to where TBN should have started out? I've never had this done, but in the age of GDI engines, I can see the value. It was the oil dilution issue that caused me to run away from Hondas and buy a Mazda. And reading stories on other sites, I see folks claim that they were able to take the report into dealers to have major warranty work done that might have otherwise gone unnoticed (trace antifreeze in the oil due to warped heads in one case). Handy idea: How to Quickly Open Oil Filters for inspection [<3m] for eyeball inspection. Yes, TBN is all I added to the analysis. According to PQIA, a SynPower VOA on 3/6/17 showed a virgin TBN of 8.88. SynPower isn't the exact same as the MaxLife variant I used, but is be quite similar so the TBN shouldn't be far off if at all. Interesting that the TBN looks consistently strong. Ironically enough, PQIA just published new results yesterday. One of them was Valvoline Synthetic MaxLife, virgin TBN is 9.16. The formulation has changed a bit compared to what I used, but I think it's a safe bet that the virgin TBN of what I used was around 9. So much minutia to wade through in life. As I understand it, the "B" in TBN (Base) fights off the acids in the oil so as to preserve the oil's lubricating properties...it has no other function, and "too much" of it does no harm. So starting off with a higher number may or may not be of value, since all that is required is "enough" to neutralize the acid that's present. I find it interesting that the Base is consumed quickly, then levels off, and then decays slowly. Makes one wonder exactly what is going on in there...chemically speaking. I wonder if there's a consistent amount of Base consumed over running time, such that those oils with a higher starting number could be used longer before approaching a level of 1. Then you wonder how many of those metals are a byproduct of combustion, and how many are shards of motors. What makes up the TBN is equally important as the TBN itself. Even 8 or so years ago you'd see some of the top tier synthetics pushing TBNs of 12. Now, they're almost always in the 8-10 range, typically on the lower end. As base oils improve and additive technology improves, I think we'll see a lower starting TBN because TBN retention is stronger. I wonder if that means a future like-kind decrease in Acceptable Minimums on the reports. This thread has caused me to go do some reading on the subject of oil analyses. Many articles claim that except for diagnosing a specific one-time issue, they provide no value (mostly because--like "the best fuel for my car"--we don't drive in repeatable controlled laboratory conditions.) But for what amounts to the cost of an extra couple of gallons of gas per month, there's lots of good info to be had in each discrete report as well as with the trends. I also noticed that the Values Should Be column for properties only apply to the then-current sample. Have they changed for you from report to report? They're obviously not driven by past data/averages (no viscosity samples came anywhere near the high end of their "Should Be" ranges). And they are the same on your 55,000 mile report as they are on the 2,700 report CZ5GT posted. I'm not entirely sold on this point. Most UOAs I've seen show a correlation between flashpoint and fuel dilution. For instance, here is a graph just from my experience. Trace results were given a value of 0.2.